For Schubert, the winter cold was less the expression of directly physical discomfiture than one of the mental state of inner isolation. 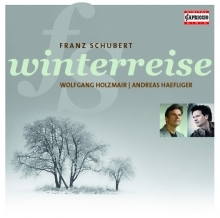 Schubert seems personally to have identified with the fate of a wanderer full of restlessness. This depression is not just melancholy or even sentiment. ‘He was certainly not born a melancholic, but became one in this world, which he called miserable and had been poor and empty for him since his days at boarding school’, Hans J. Fröhlich writes in his Schubert biography. 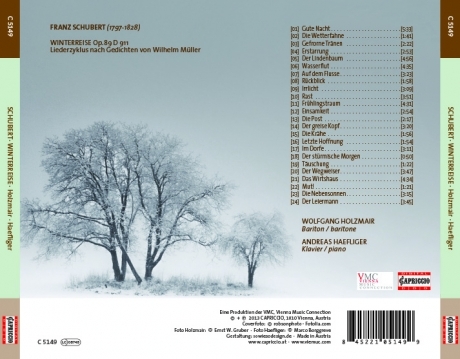 Wolfgang Holzmair performs in recitals throughout the world, including London, Lisbon, New York, Washington, at the Risör Festival (Norway), Bath Festival (UK), Menuhin Festival (Switzerland), Bregenz Festival and Carinthian Summer Festival (Austria), and in 2012 again in London, New York and Washington, as well as in Baltimore, Berkeley, Moscow, Oxford, Liège, etc.